In the dark streets of Victorian London, Arsène Lupin, Henry M. Stanley, Van Helsing and Dr. Jekyll meet with Mr. Hyde, Dracula, the Werewolf, the Marsh Phantom… in Monsters vs. 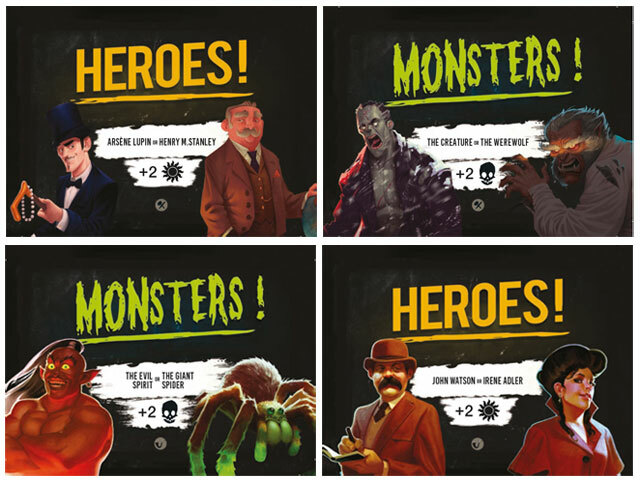 Heroes: Victorian Nightmares, characters from mystery and horror stories duel with cards, in a fun and crazy game designed by the Spanish game author Enrique Dueñas. The game was first released in 2015 by Gen-X Games, as “London after Midnight.” After a license agreement with Pendragon Games Studio early this year, a new version was developed, and Ares Games got wordldwide rights for the English edition, to be released with the new title “Monsters vs. Heroes: Victorian Nightmares”. In Monster vs. Heroes, players secretly join one of the factions by taking a random faction card at the start of the game. Even if players belong to the same one faction, there are no teams – it’s a competitive game. The main mechanic is very simple: at each turn, players can only draw a new character card from the deck or play one character card of their hand in their area on the table. As players can have only three cards in hand, many times they are pushed into play cards they would prefer to keep in hand. Each card represents a character with a special skill that can bring very different effects. The skills of most of the characters are designed to harm others and not to benefit them. The factions are secret and smart players can lead the others to discard valuable cards or get rid of good cards in the belief that they are hurting the opponents. 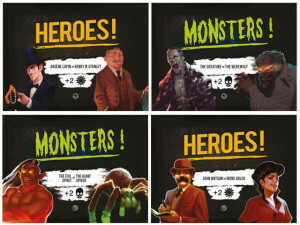 Hero cards are distinguished by an orange name and at least one white sun symbol, while Monster cards have a green name and at least one black skull symbol. The black or white icons in the upper–right corner of the card will affect the players’ final score. Cards with a purple name are neutral cards and may or may not have a point value. When the last character card is drawn, the game ends and after discarding the cards they have in hands, all players reveal their faction cards, showing their alliance for the game. Then they check the cards in their area, adding up the number of sun and skull icons present on their cards, scoring 1 point for each icon of his faction, and losing 1 point for each icon of the other faction. Each faction card also shows two characters, and if a player has one or both in his area, he scores two additional victory points. Whoever scores the highest number of points is declared the winner of the game. Monsters vs. Heroes: character cards. 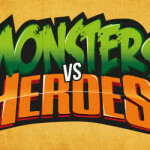 “Monsters vs. Heroes is placed somewhere between the microgames and the more traditional card games. It’s very easy to learn and suits to any kind of audience, from veteran gamers to children who just learn the simplest card games. It was designed to allow players to ‘breathe’ in the theme and feel that the characters blow sky-high and die”, Dueñas says. Dueñas originally designed the game as a free Internet game using characters of a renowned franchising. “When I noticed its potential, I started to think on developing it into something ‘marketable’. The first idea was to move the game to another setting, recognizable but not tied by copyright. In few time, I thought at the classic monsters. I love the monsters, I love the nineteenth-century aesthetic, and the “Hammer” horror movies. Once I defined the theme, the name 'London after Midnight' came immediately in my mind”. 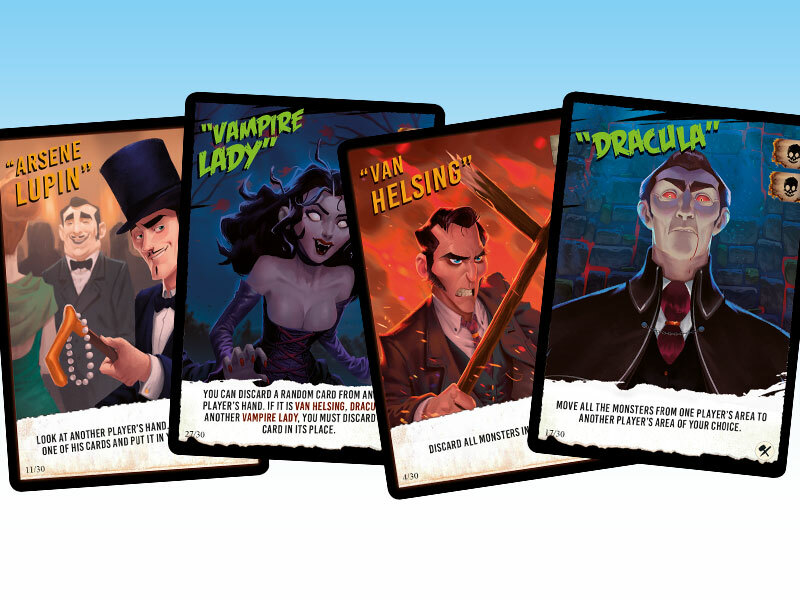 Faction cards show two characters and are dealt to players at the start of the game. 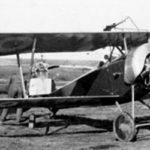 From the first prototype to the definitive version of the game, few changes were made. The basic rules are the same and only the abilities of some characters were modified. Dueñas first thought of using the visual style of 1930s movies, black and white, but after some meetings with the illustrator James Castillo Murphy, they decided for something more colorful and aggressive, with illustrations inspired by the iconic actors of the Hammer, as Christopher Lee and Peter Cushing. 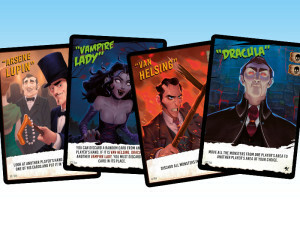 The game setting presents not only classic monsters, but both literary and real characters from Victorian England, so that the theme is part of the gaming experience. The first volume of Monsters vs. Heroes, “Victorian Nightmares”, combines two themed decks: “London after Midnight” and “Sherlock in Hell”. The first includes classic horror characters like Dracula or the Werewolf, and 19th century literary heroes, such as Abraham Van Helsing or Arsène Lupin, while Sherlock in Hell includes characters from the Sherlock Holmes stories as heroes, and different demons as monsters. With one deck, the game is suited for up to 4 players, and last about 20 minutes. With two decks, up to 8 players can join it, adding about 10-20 minutes of gameplay. Monsters vs. 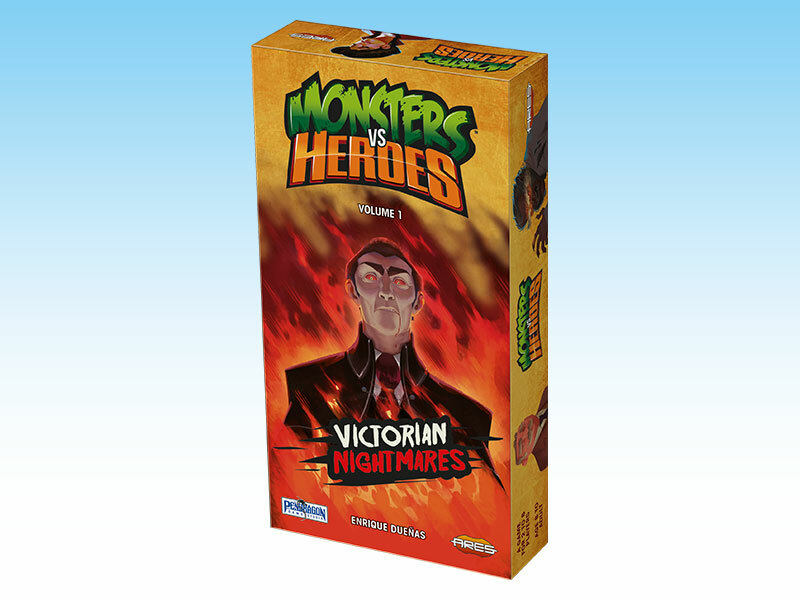 Heroes: Victorian Nightmares is due to release at the Essen Spiel, and will be in stores in November.